They say it can power a vehicle to run cleanly for 100 years with one fueling. They say the technology is safe, intrinsically proven and produces no high-level waste. 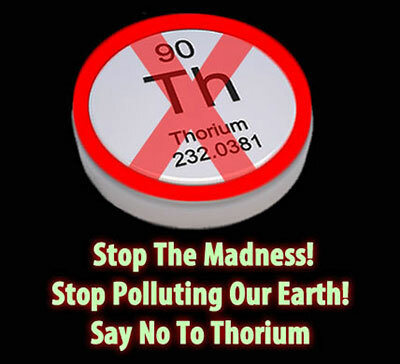 Scientists all over the world are chiming in on thorium as the next viable and alternative energy source to uranium. However, thorium still represents a very large threat to the planet whose problems over current nuclear systems exist only in details. It is not eco-friendly by any stretch of the imagination, although it is being promoted as such to nations around the world. It's not renewable, green or clean and definitely not the answer to the world's energy crisis as scientists around the world are deceptively claiming. Due to its extreme density, thorium is being highlighted for its potential to produce tremendous amounts of heat. Many companies have been experimenting with small bits of thorium, creating lasers that heat water, producing steam which can power a mini turbines. According to CEO Charles Stevens from Laser Power Systems (LPS) from Connecticut, USA, just one gram of the substance yields more energy than 7,396 gallons (28,000 L) of gasoline and 8 grams would power the typical car for a century. Thorium is a radioactive chemical element. It produces a radioactive gas, radon-220, as one of its decay products. Secondary decay products of thorium include radium and actinium. In nature, virtually all thorium is found as thorium-232, which undergoes alpha decay with a half-life of about 14.05 billion years. ...have all experimented with using thorium as a substitute nuclear fuel in nuclear reactors. Besides being radioactive, thorium is also a highly carcinogenic heavy metal used in military targeting systems and has been found in honey, milk, and other areas of the food chain where the military has been testing thorium such as Sardinia. Sardinia is the second largest island in the Mediterranean Sea - a paradise with diverse wildlife and beautiful beaches. For over 50 years Sardinia has been used by militaries and arms manufacturers as a testing ground for bullets, bombs, missiles and drones and dangerous chemicals. "willful omission of precautions against injury and aggravated disasters or because they falsely certified the absence of pollution with the aim to hide the environmental disaster." The documents from Fiordalisi's investigation have now been turned over to a tribunal for prosecution. Fiordalisi opened his investigation when he learned the results of cancer research in the Quirra area. In the last 10 years, 65 percent of shepherds were diagnosed with leukemia, lymphomas and autoimmune diseases. He suspected that the materials used in the polygon contaminated soils, pastures, water and air poisoning people, plants and animals as a consequence. He explained that thorium is much more harmful than depleted uranium, and that the area of the polygon of Quirra was completely impregnated. This substance has found its way into cheese, worms, mushrooms, shepherds and animals: pigs born with six legs and lambs with a single large eye. He stated that the 1187 Milan missiles that were launched between 1983 and 1999 which, in the opinion of the nuclear physicist Evandro Lodi Rizzini were responsible for an epidemic of cancers and lymphomas in the military due to the release of radioactive substances. "One micro-gram, that is, one millionth of a gram is sufficient to kill a person. It causes a rise in atomic disintegrations; with a production of 2000 alpha rays a day, nuclear radiation is most damaging." Numerous claims of advantages for thorium as a nuclear fuel and for LFTR (Liquid Fluoride Thorium Reactor) design have been made over conventional solid fuel reactors. Claim: the fissile uranium (233U) produced by thorium reactors is not “weaponisable” owing to the presence of highly radiotoxic 232U as a contaminant. Response: 233U was successfully used in a 1955 bomb test in the Nevada Desert under the USA's Operation Teapot and so is clearly weaponisable notwithstanding any 232U present. Response: the design of molten salt reactors does indeed mitigate against reactor meltdown and explosion. However, in an LFTR the main danger has been shifted from the reactor to the on-site continuous fuel reprocessing operation - a high temperature process involving highly hazardous, explosive and intensely radioactive materials. A further serious hazard lies in the potential failure of the materials used for reactor and fuel containment in a highly corrosive chemical environment, under intense neutron and other radiation. Response: important elements of the LFTR technology were proven during the 1970s Molten Salt Breeder Reactor (MSBR) at Oak Ridge National Laboratory. However, this was a small research reactor rated at just 7MW and there are huge technical and engineering challenges in scaling up this experimental design to make a 'production' reactor. Spread the word about Sardinia. More information is available at "Sardinia - Cancer, Contamination, Militarization in Paradise" where the original 7500-word research document is shown. Do we really want another polluting energy source with high-level waste which is non-renewable and highly carcinogenic? Before jumping on the thorium bandwagon, please share this information, do your own research and think twice before spreading the hundreds of myths (not facts) about this very dangerous alternative to uranium.